How bail works in different states and even counties can be a bit confusing; so we’ve put together this site to list the many ways how bail bonds work and how to post bail. With the help of well experienced local bail bonds agents, posting a bail bond is a quick and easy process. Bail agents will help you understand how bail works and all the payment options you have, and provide you with all the information you need about bail. Simply choose your state or click on any of the pins for a bondsman in your area. Are you in need of a professional bail bondsman where you live? Do you need a bail bondsman and you are not in the same city or state where the defendant needs bail? Get in touch with one of our experienced bail bond agents for State and County bonds. Nationwide bail bond agents are available 24 hours a day, 7 days a week and most can even post your bail by phone to get your friend or loved one out of jail faster. Being Accused of a Crime Does Not Make You a Criminal! Choose the state below and find a reputable bail bonds company who will post the bond you need, now! Use a handy bail calculator like this one to find the lowest costs for your bail bonds in your state. We offer this bail bonds calculator free for any bail website. To try it: simply key in the amount of your bond and click the calculate button to figure the least amount you will pay for a bond. Your Opportunity Of Bail Is a Right! Bail bond rights are protected by the Eighth Amendment to the US Constitution. Bail is set by a judge commensurate to the charge and record of the individual. Bonds must be set at a reasonable level for each defendant. Don’t wait or get stuck in jail, contact a bail bondsman in your area as soon as possible to get your loved one free from jail right away. Bail bonds fees are typically set at the state (or county) minimum, which is normally 10% of the face value of the bond. Take for example a bond amount of $5000. That bail bond would normally cost $500. The $500 is called the premium and it is not refundable. So how bail bonds work when you can’t afford the entire bond? At most bail agencies, they may accept payment plans and also accept cash, credit cards and certified checks. You’ll need to read through the states bond listing information for the bail amount percentage and any other additional fees. What happens when you bail someone out of jail? When you bail someone out of jail you are called the bail bond indemnitor, or co-signor. You are fully responsible for the defendant to show up in court and make all court appointments. If the defendant skips bail, you will owe the bail bond company the full bond amount. If you have an outstanding warrant, it’s a good idea to post bail with a bondsman before you turn yourself in. How Bail Bonds Work When you Have Outstanding Warrants? Routine traffic stops of a minor driving infraction could end up with your being arrested and detained in a local police station or county jail. Those defendants who are unfamiliar with the way the legal system operates will be totally out of their element. This is when bail bond agents come to the rescue of those incarcerated. Don’t let your friend or family member remain behind bars because they can’t afford bail. 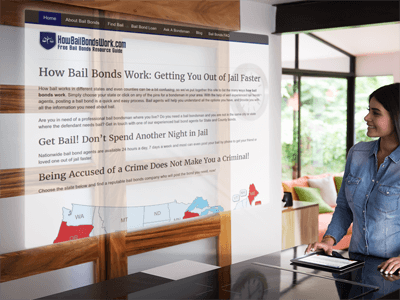 Read honest reviews of local bondsmen before you post bail, plus learn how bail bonds work throughout the United States and get informed, save money and save time when posting bail.